For readers of Laura Hillenbrand's Seabiscuit and Unbroken, the dramatic story of the American rowing team that stunned the world at Hitler's 1936 Berlin Olympics. To ask other readers questions about The Boys in the Boat, please sign up. Hello! For those of you who have read this book, do you think it would be a good choice for a book club read? It's a wonderful story. Well written; the story has so many facets you feel for the people. I am from the area, and enjoy "seeing" it in my mind's eye. I absolutely love this book and highly recommend it to everyone especially those that have an interest in history from the Pacific Northwest. I don't know why I put off reading this book so long, except I was reading other things. BUT when I went to visit my son, who is the grandson of Joe Rantz and named his son Joe after him, I began reading their copy and could not put it down. Everything else I was reading was put aside. I then realized I would not finish it before I had to leave and besides, I wanted to OWN it. So I got the Kindle version. Besides, my son was also reading it and we had two book marks, his and mine in the book. So I don't know why I put off reading this book so long, except I was reading other things. BUT when I went to visit my son, who is the grandson of Joe Rantz and named his son Joe after him, I began reading their copy and could not put it down. Everything else I was reading was put aside. I then realized I would not finish it before I had to leave and besides, I wanted to OWN it. So I got the Kindle version. Besides, my son was also reading it and we had two book marks, his and mine in the book. So it made things easier. Wow, I was surprised at all the things I learned about Joe and Joyce I had not known before. I remember holding Joe's Olympic gold medal long ago when I first married his son, the first and last such medal I have ever held. I remember because it made such an impression on me. I remember the talk of the other "boys" and how they got together and I remember being invited to the planting of the tree for Joseph Rantz but did not go. I don't remember why. I have always proudly told everyone that my son's grandfather won an Olympic Gold Medal in Hitler's Germany in 1936. Who else can say that? Not many. But really, I had no idea what was involved in that accomplishment. But after reading this book I realize how very special those boys were, and how important it was that it all came together, the very special men who all had hard upbringings, who had to scrape and scratch for every morsel they ever got, the now legendary boat maker and the coxswain. It took a very unique mix of ingredients to make that win happen and take home that Gold Medal. But it had to be told in a way that we could all see it,feel it, get it. And Daniel Brown did just that. He interviewed Joe Rantz months before his death. I remember a man who was tall, handsome, strong and always willing to help. I remember as a young single mother after I had divorced his son, how very warm and welcoming they were to me and how Joe would not only fix my broken down cars but would show me how he did it. I remember when he fell from the tree when he was still out there too late in his life, climbing trees and cutting them down. I remember saying to myself, if only I could find a man like him, I would keep him. He was my ideal man but I had no idea how he came to be that man. Update: Sadly last December 15th 2016 At 1:15 pm Joseph Devon Rantz, great grandson of Joe Rantz, was killed in a car accident riding with his friend who was driving in the pouring rain. The car hydroplaned in the rain crossed the median and hit a utility truck and then the bridge abutment. Both boys were wearing seatbelts but the driver was thrown from the car into Dry Creek. Both boys were killed instantly. We have had tremendous, kind support from the community. We were devastated and just broken by the loss. He was a good kid, 18 years old in his senior year of high school, a lefty pitcher on the varsity baseball team. We loved him and miss him every day. If I told you one of the most propulsive reads you will experience this year is the non-fiction story of eight rowers and one coxswain training to attend the 1936 Olympics in Berlin, you may not believe me. But you’d need to back up your opinion by reading this book first, and you will thank me for it. Daniel James Brown has done something extraordinary here. We may already know the outcome of that Olympic race, but the pacing is exceptional. Brown juxtaposes descriptions of crew training in Sea If I told you one of the most propulsive reads you will experience this year is the non-fiction story of eight rowers and one coxswain training to attend the 1936 Olympics in Berlin, you may not believe me. But you’d need to back up your opinion by reading this book first, and you will thank me for it. Daniel James Brown has done something extraordinary here. We may already know the outcome of that Olympic race, but the pacing is exceptional. Brown juxtaposes descriptions of crew training in Seattle with national races against the IV League in Poughkeepsie; we see developments in a militarizing Germany paired with college competitions in depression-era United States; individual portraits of the “boys” (now dead) are placed alongside cameos of their coaches; he shares details of the early lives of a single oarsman, Joe Rantz, with details of his wife's parallel experiences. For one thing, there is the sustained coordinated rhythm of many bodies performing as one, starting from zero and demanding as much as two hundred heartbeats per minute in a sprint, erasing the individual and coalescing into something much bigger than each individual effort could achieve. This particular crew overcame the usual and expected race-day catastrophes to deliver the sweetest win they or their coaches had ever experienced. It is a story at the time and on the level of the historic Seabiscuit: An American Legend victory: speaking of the horse, the race, and the book by Laura Hillenbrand. One of the things about a great book is the energy one derives from having encountered it. Great teachers generate interest in a subject and Brown did that in this book. Even if you have no knowledge of or interest in rowing before you begin, you will be fascinated by the end. In addition, Brown tells us some things about the Third Reich and Leni Reifenstahl’s photography for Hitler and of the 1936 Olympics that makes me want to revisit that film record. Reifenstahl had taken pictures (after the event) of the rowing crews from inside their boats, among other things, and when the film Olympia came out two years later, it cemented her reputation as a great filmmaker. Of course she is best known for creating the great propaganda film, Triumph of the Will . She used camera angles and techniques that had never been used before and was extraordinarily successful in supporting the political machine that was Germany in the 1930s. I love books and movies that get you interested in sports you never cared about before. Also, I love how the Olympics does the same thing. You turn on the TV and suddenly life itself depends on the outcome of some not quite mainstream sport like biathlon, cycling, diving, curling, etc. - and, while watching, you become an expert at all the finer points of the sport. The Boys in the Boat is the perfect example of this type of story. And, with the Winter Olympics coming up, the perfect way to whet I love books and movies that get you interested in sports you never cared about before. Also, I love how the Olympics does the same thing. You turn on the TV and suddenly life itself depends on the outcome of some not quite mainstream sport like biathlon, cycling, diving, curling, etc. - and, while watching, you become an expert at all the finer points of the sport. The Boys in the Boat is the perfect example of this type of story. And, with the Winter Olympics coming up, the perfect way to whet my appetite for the competition. In this case, the sport is rowing. The underdogs are the working class Western US college boys competing against the upper class Ivy Leaguers of the East. The true story of their progress to success and Olympic glory is enthralling. The writing is superb. You will find yourself falling in love with rowing even if you have never seen an oar slice through the water before. History buffs, sports fans, and people who love a good story about the disrespected underdog finding ultimate success in the end - this book is for you! Side note - this book also does a great job capturing the development of the Nazi regime as they rose to power while preparing for the 1936 Olympics. The stories of whitewashing the towns to cover up poverty and the newly established oppression of Jews and other minorities is heart-wrenching. Tales of the propaganda machine and the wool pulled over the eyes of the world is amazing. At one point, the author goes through a list of the things the athletes did "not see", and I was wondering if this was an intentional play on "Nazi". I read this book because my father kept telling me that I would enjoy it. Truthfully, l finally picked up so he would stop nagging me about it even though it is about sports and history- my two favorite things. 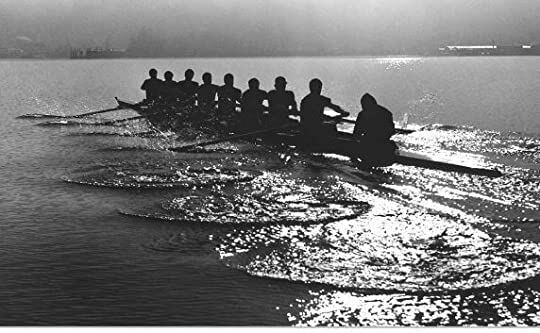 Boys in the Boat is the motivational story of Joe Rantz, his wife Joyce, and the other members of the 1936 Washington University rowing team that won gold at the Berlin Olympics. This story is partially the story of Joe's perseverance during the depression and also his rowing team's quest I read this book because my father kept telling me that I would enjoy it. Truthfully, l finally picked up so he would stop nagging me about it even though it is about sports and history- my two favorite things. 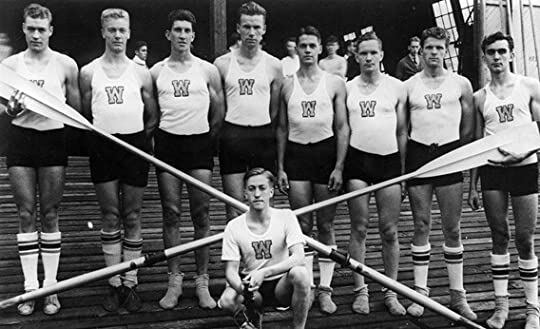 Boys in the Boat is the motivational story of Joe Rantz, his wife Joyce, and the other members of the 1936 Washington University rowing team that won gold at the Berlin Olympics. This story is partially the story of Joe's perseverance during the depression and also his rowing team's quest to make it to the Olympics and subsequent epilogue. The story is definitely inspiring not just because the US team won gold in rowing in Berlin but because of Joe's story. Abandoned by his father and stepmother and forced to live alone from his early teens, Joe worked his way to college and lived at the university gym. Joining the rowing team as way to keep in shape, Joe still had to work between semesters and during the summer even taking part in the construction of the Cooley Dam, just so he would have enough money to pay for tuition. Although during the depression, he somehow cobbled together the $25 necessary each term to stay in school. This is definitely a far cry from today's pampered NCAA athletes. I honestly didn’t think I would be interested in a book about rowing, but I just couldn’t ignore the fact that so many people loved this book. I added it to my list of books to read about three years ago and I’m so glad that I finally got to it because it was about so much more than the sport. Nine young men making up the USA Rowing Team in the 1936 Olympics in Berlin weren’t just rowing for a medal, they “were rowing for a set of values, a way of life”. They were the USA Olympics Rowing Team competing during a time when Hitler and the Nazis were making laws against Jews, burning books and planning the horrors that we now know occurred. It’s about how this team of young men from working class families who worked hard, endured hardships, and achieved greatness in the eyes of the world, and most certainly in the eyes of their fellow Americans. It’s a reflection of the time in the US just after the stock market crash and the Great Depression. While it’s the story of this team and this country, we also experience the story on a more personal level through Joe Rantz’s life. The narrative alternates between the time that Joe Rantz is a student at the University of Washington and to his sad childhood. Joe seemed to live an ideal life, happy with his mother and father and brother until his mother dies when he was four. It was heartbreaking to see how he was abandoned time and time again when his father remarries and his stepmother just doesn’t want him around. At ten he lives a “life in exile” and at fifteen ends up on his own, digging ditches, building barns, doing whatever it took to support himself and eat . With such stamina and dedication, working as a janitor at the Y for a room, practicing, and studying, I couldn’t help but love Joe and his teammates and pull for them with each race. Highly recommended, even if you’re not interested in crewing because this is just so much more. This was my first audio book. I tried previously and couldn’t get used to the feeling that someone was reading to me, but I thought I’d try again. It turned out to be a great experience, no doubt because of the inspiring story . If someone had told me I would become emotionally invested is a book about rowing, I would have thought they were crazy. First, I knew little about rowing and second, I had no desire to learn. A read for a group I am in had me picking up this book and I am so glad I did. As many mothers have said, try it before you decode you don't like it. An amazing balance of human interest, history and sport. Joe Rantz's story had my mothers heart wanting to give his ten year old self a big hug. His story and If someone had told me I would become emotionally invested is a book about rowing, I would have thought they were crazy. First, I knew little about rowing and second, I had no desire to learn. A read for a group I am in had me picking up this book and I am so glad I did. As many mothers have said, try it before you decode you don't like it. An amazing balance of human interest, history and sport. Joe Rantz's story had my mothers heart wanting to give his ten year old self a big hug. His story and the man he became is simply heart breaking and admirable. He and the other boys wormed their way under my skin and I found myself holding my breath more than once during their races. The book went back and forth between the US and Germany. The snow job they pulled on the world during the Olympics, convincing many others that they were a progressive and fair nation. There were small moments of humor too, as when the German people greeted our athletes with a raised arm and shouted, Heil, Hitler, our athletes raised their arms and answered back, "Heil, Roosevelt. The sport of course took up much of the book from the scull maker, Popcock to the coach, Al Ubrickson. The hard work that went into training, and of course the races, competitions between the East and West coast. The lives of the men in the boat and what happened to them after. All in all I found this a stirring read, a wonderful book. This book was all right, but there was just too much of it and the title isn't very descriptive. It's really only about one of the nine "boys in the boat," plus their coach and the boatbuilder. Oh, and Hitler. Perhaps the author came to the project 10-15 years too late; only one of the main subjects survived to be interviewed by 2006, and that figure (Joe Rantz) makes the book worthwhile. Having grown up dirt poor, abandoned by his family, with a strong work ethic and a charming, loyal fiancée, This book was all right, but there was just too much of it and the title isn't very descriptive. It's really only about one of the nine "boys in the boat," plus their coach and the boatbuilder. Oh, and Hitler. Perhaps the author came to the project 10-15 years too late; only one of the main subjects survived to be interviewed by 2006, and that figure (Joe Rantz) makes the book worthwhile. Having grown up dirt poor, abandoned by his family, with a strong work ethic and a charming, loyal fiancée, he's someone you can't help but root for. But his story is buried in dozens of pages of descriptions of early twentieth century crew rivalries and what woods to make boats out of and a highly superfluous retelling of the early years of Nazi rule. All of that material is less interesting than Joe Rantz's life, and all of it is noticeably less immediate. I often like nonfiction that weaves several strands together so my complaint here is chiefly about the comparative worthwhileness of the strands rather than the author's art in pulling them together. Then there's the factor of the book's sheer length; my sigh when I realized I was hundreds of pages in and only up to the start of junior-year training must have been audible from Lake Washington. I've written in another review or two about how the events of WWII, when you stare at them long enough, go from incomprehensible to almost unbelievable. But this book (and In The Garden of Beasts) conjures the opposite cognitive problem, which is that it is impossible for the reader to put the facts of what happened after the 1930s out of our minds. Both books are trading on a rather ghoulish dramatic irony of innocent, upstanding Americans willingly visiting the evil Nazi state without realizing the depth of its coming crimes, but neither manages to evoke the mindset that allowed the Americans to do so, or the historical fact that the later events of WWII and Holocaust were not inevitable. In Erik Larson's book, I think there is a point to be made that a different man serving as ambassador might have measured up the danger more wisely, but where this book is concerned, it would be absurd to say Joe Rantz and his fellows--who had barely been out of Washington State--should have been more perceptive or that they could have done anything. Even whatever pleasure you might get from seeing an American team win under Hitler's nose has to be tempered by an appreciation of how meaningless this was in the long run. The power in this story comes from the boys' personal stories of overcoming Depression-era obstacles, so padding the book with discussions of Leni Riefenstahl and the fate of a particular German-Jewish family after Kristallnacht draws the wrong kind of contrast by putting the race in the context of world history rather than personal achievement. Why did I wait so long to read this? Well, a couple of reasons: 1) It’s about rowing…No offense, it’s just not a sport I’m wowed by. 2) It’s about a group of Americans going to the 1936 Olympics in Berlin. Hey, I’m Canadian, eh... American patriotism and propaganda isn’t my gig. So finally I picked it up; put it down. Then thought to hell with it, I’m doing this. I cracked the spine, sat down and for the last few days, every spare moment has been living and breathing this story. It starts with th Why did I wait so long to read this? Well, a couple of reasons: 1) It’s about rowing…No offense, it’s just not a sport I’m wowed by. 2) It’s about a group of Americans going to the 1936 Olympics in Berlin. Hey, I’m Canadian, eh... American patriotism and propaganda isn’t my gig. It starts with the life of Joe Rantz, the crew member who sat in the 7th seat of the boat. The abandonment he experienced as a child that shaped him into becoming the man he did. It’s of course about the sport - which in itself is a paradox - while the whole is greater than the sum of its parts, each member brought unique qualities and experiences to compliment each other to make a successful and cohesive crew . The determination, the skill, the heart, soul and passion that goes into the making of an athlete; the making of a team; the realization of a dream. It’s about the two faces Germany wore for the hundreds of thousands of spectators who came to watch. The deception and political ploys used to prevent suspicions from being roused. It will always eclipse the event to a certain degree. These were remarkable men -their sacrifice - committed dedication - had to scape for everything -their boat wasn't just handed to them... not all had cozy supportive families. Joe Rantz's humanity - especially - makes you want to be a better human being yourself. All these men were humble - with committed dedication -- they were a team. Proud to be American! With the American depression -the dust bowl -the rise to Hitler - Wow!!! With the American depression -the dust bowl -the rise to Hitler - tensions kept building to the end until you just want to cry. Its moving. Spirit sings... we feel it! I had no real desire to read a book about sport let alone read a book about rowing but something about a frinds's review here on goodreads pushed me to read this book and I am so glad I did as I loved every moment of it. I read this on Kindle (oh how I wish I owned a Hard Copy of this book) and I listened to it on audio and what wonderful narrator Edward Hermann is. He just made this book come alive and what a wonderful easy listening voice he has. Yes for those of you out there wondering if there are descriptions of boat building and rowing techniques and stragaties but there is so much more to this stroy. I fell in love with Joe Ranrz and his story and zest for life, I loved the details given of the Berlin Olympics and how Hitler tried to showcase Germany to the rest of the world . I learned so much from this book. I also really enjoyed the sense of time and place set around the depression in America. Above all I It is an inspirational story of eight young men from different backgrounds who learned to work as a team and overcome tremendous obstacles, defeating elite teams from other universities and finally the German crew in Berlin. Everyone should have heard of this book by now. It's about the crew team that won the gold medal in the Berlin Olympics. This is really perfect from a non-fiction standpoint. We have poverty and hard work - Joe, our focus, is very poor and works insanely hard just to afford food. We have Hitler's Germany - always a winner if you want to sell books. We have Americans triumphing on an international stage, "sticking it to Hitler," as it were. Surefire winner there. We have "men, patriots! united in har Everyone should have heard of this book by now. It's about the crew team that won the gold medal in the Berlin Olympics. We have "men, patriots! united in harmony, working as one towards a common goal" etc. Very moving. I have to say Brown is a great author. The book is readable and interesting. I love "struggling to survive in poverty," I love "working physically very hard in order to be a super-athlete" and, of course, I love learning about history. So all those things worked in the book's favor. However, crew racing bores me. I'm sorry, Brown did his best to make the races exciting, but after reading about twenty of them I was done. Actually I was done after the first two. By the second half of the book I found myself drifting when the "boys" were in an actual race. There's only so many ways you can describe rowing and pulling ahead of your opponents. This is probably not a drawback to most people. I'm not a sport-viewer. I watch the Super Bowl once a year and that's it. And that is really the only negative thing I have to say about this book. Now, these aren't "negatives" exactly - and in no way affected the books rating, but I did notice some things about Brown's writing that I found quite funny. ONE: He tends to be a bit cheesy and overdramatic. However, I realize that adds when you are writing non-fiction. No one wants dry non-fiction. No one wants to be bored. So this actually could be seen as a plus. TWO: Hilariously, Brown mentions what women think of each man he introduces. Let me give you some examples. He had a strong jawline, fine, regular features, gray eyes verging into blue, and he drew covert glances from many of the young women sitting on the grass. Okay, okay, we get it. Women were apparently gaga over him. Great. Then we meet Shorty Hunt. He was also quite good-looking, with wavy dark hair. People liked to compare him to Cesar Romero. He was six foot three as a freshman, and his fellow students promptly dubbed him Shorty. He'd use the name for the rest of his life. He was something of a fashion plate, always well dressed and forever drawing the eyes of young women around him, though he did not seem to have a steady girl. This amused me to no end. "Hey," I'd say to my friend. "Brown says this guy is ATTRACTIVE." "Yeah," my friend would snappily retort. "How many women were giving this one covetous glances? FIVE women gave Joe the eye as he strolled across campus, but only THREE women checked this one out!" Then we'd laugh and laugh. It's not a question of whether you will hurt, or of how much you will hurt; it's a question of what you will do, and how well you will do it, while pain has her wanton way with you. When I read this I was like o.O I had to re-read it to make sure I was seeing things correctly. Pain has her wanton way with you? Really? Wow. He made it over the pass and began to drop down through dry ponderosa pine forests to the apple and cherry orchards of Wenatchee, where magpies, black and white, flashed among the cherry trees, seeking ripe, red plunder. Every time this happened I had a good laugh. It didn't happen super-frequently, which was good, because then whenever I came upon a fresh one I was startled into laughter again. Of course, these are just little personal notes and they didn't affect my rating at all. Tl;dr - This is good non-fiction. Juicy, fast-paced, and character driven. A great combination of a character study and exciting history. I can see why this book is very popular. The only drawback for me would be the actual racing - not Brown's fault, he does a stellar job of making crew sound exciting, but I'm just not very interested, despite his best efforts. I'd recommend this if you are looking for a non-fiction romp. The fact that I had no interest in, and in fact dreaded reading this book club selection yet ending up loving it, is testament to how compelling this inspirational story was. I have no interest in rowing. Actually, I have no interest in sports. Thankfully, this is not just a book about rowing and Olympic races. The author seamlessly weaves in details about Germany and Hitler's rise to power, the dust bowl, America in post-depression years and on the cusp of WWI 4 stars - It was great. I loved it. I have no interest in rowing. Actually, I have no interest in sports. Thankfully, this is not just a book about rowing and Olympic races. The author seamlessly weaves in details about Germany and Hitler's rise to power, the dust bowl, America in post-depression years and on the cusp of WWII, and illustrates with factual stories the sharp contrast of our culture then vs. now, particularly in regards to parenting. The author heavily focuses on the life of one particular rower, Joe Rantz, and his story breathes so much life and soul into the book. "...this is, in many ways, a book about a young man's long journey back to a place he can call home." The author includes many pictures throughout the book which were greatly appreciated and help to place the reader more firmly in the story. Surprisingly few parts of this book were slow (surprising given my utter lack of interest in the subject). A few of the races were too detailed for my tastes and bogged down the pace, but on the other hand, the details of the Olympic race were thrilling and suspenseful, despite already knowing how it all ends. "And so they passed away, loved and remembered for all that they were - not just Olympic oarsmen but good men, one and all." UW Crew of 1936 at their 40th Reunion. Favorite Quote: They are almost all gone now - the legions of young men who saved the world in the years just before I was born. But that afternoon, standing on the balcony of Haus West, I was swept with gratitude for their goodness and their grace, their humility and their honor, their simple civility and all the things they taught us before they flitted across the evening water and finally vanished into the night. First Sentence: This book was born on a cold, drizzly, late spring day when I clambered over the split-rail cedar fence that surrounds my pasture and made my way through wet woods to the modest frame house where Joe Rantz lay dying. To be able to tell a story about an event where the outcome is known ahead of time, about a subject the reader has no interest in, the pages seemingly turning themselves and keeping one riveted all the way is some feat. A team of nine boys, sons of loggers, shipyard workers, and farmers, whose coach would come to think of as the greatest racing crew in history, take us on a vision quest through the depression years. Hard work, sheer guts, extreme determination, and supreme respect for one anothe To be able to tell a story about an event where the outcome is known ahead of time, about a subject the reader has no interest in, the pages seemingly turning themselves and keeping one riveted all the way is some feat. A team of nine boys, sons of loggers, shipyard workers, and farmers, whose coach would come to think of as the greatest racing crew in history, take us on a vision quest through the depression years. Hard work, sheer guts, extreme determination, and supreme respect for one another would take them to Hitler’s Germany and the 1936 Olympics, the same games that would host the talents of Louis Zamperini and Jesse Owens. I read this book aloud to my husband over morning coffee and was at times breathless and choked up. We took it slow not wanting it to end, afterwards going to the web to view pictures and archival film footage of their thrilling victory. Most worthy of the many comparisons to the story and race of the amazing Seabiscuit. Bravo! This is a bit more than the story of the 1936 Olympic crew challenge by the team from the University of Washington. Using one of the crew members as the focus, it combines his personal experience against the backdrop of the important historical events of that era (the 1929 stock market crash and resultant depression, the dust bowls, the rise of Hitler and the Third Reich, etc.). It made for a richer story with the added context. While the backgrounds and histories of the other members of the 9-m This is a bit more than the story of the 1936 Olympic crew challenge by the team from the University of Washington. Using one of the crew members as the focus, it combines his personal experience against the backdrop of the important historical events of that era (the 1929 stock market crash and resultant depression, the dust bowls, the rise of Hitler and the Third Reich, etc.). It made for a richer story with the added context. While the backgrounds and histories of the other members of the 9-man crew team were also provided, Joe Rantz's story was the main focus. His was symbolic of the boys who became men even before they started college given the challenges of that time. By the time I got to the actual Olympic race, I felt these men had already reached heroic heights, especially Joe. Edward Herrmann was fantastic as the narrator. He brought each character to life and his calling of the Olympic race was just outstanding. I highly recommend the audio version. I really enjoy books that find a human story in the midst of a larger historical drama. “The Boys In The Boat” is such a book. 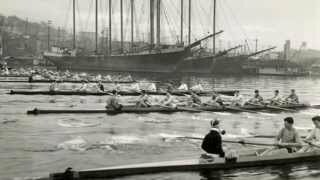 Although its primary focus is the sport of rowing, and specifically the sport on the west coast of the US, and more specifically at the University of Washington and 9 crew members and the coaching staff there, it also captures an era and the first 40 years of the 20th century very well. This text does a nice job of jumping between the life of Joe Rantz (the member of this iconic crew team that the book gives the most attention to), the history and mechanics of the sport of rowing, and the 1936 Olympic Games in Nazi Berlin. The depiction of the buildup to, and opening ceremony of, the 1936 Olympic Games is well done. The author jumps from the perspective of the boys on the US Rowing Team to the propagandist workings of the Nazi state and the manner in which they created the image of the games and Nazi Germany that they wanted conveyed to the world. It is compelling. A highlight of the text is chapter 18 where the reader is immersed in the climatic gold medal race. The writing is taut, dramatic, and creates tension in the reader despite the fact that we already know the result. Daniel James Brown is a solid writer. His prose is efficient, but not beautiful. Occasionally he tries to get poetic, and it is just not his milieu, and it shows. This is not a criticism of his style, just an observation. The good moments in this text far outnumber the bad. As I read the Epilogue, I missed my grandfather and some of the other people I have known from this generation of Americans. Our society has fallen short of the life those people lived. In this text we are hit again and again with the hardships that were such a normal part of life for most Americans during the first 40 years of the last century, and one wonders if our current generations could surpass with such flying colors the hardships that they did. 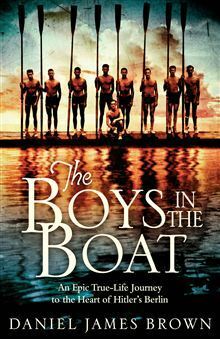 Really enjoyed reading about The Boys In The Boat and their quest to win US GOLD at the 1936 Berlin Olympics. While a bit heavy on the practice runs (for me) the excitement of the actual races kept me engrossed as well as the heartbreaking personal background of Joe Rantz, and his struggles to overcome adversity. Although not particularly a fan of boat racing, I found this work of non-fiction and the many tidbits of historical data laced throughout the story informative and memorable...........a truly amazing and inspirational read! 4.5 Stars. Quite an uplifting story of the young men from the University of Washington who took the gold medal for nine-men shell rowing at the 1936 Olympics in Berlin. Like Hillenbrand’s wonderful book “Seabiscuit” this is a tale of underdogs overcoming personal adversities and capturing the attention of a nation laid low by the Great Depression. Starting in 1933, we get the story of a young man, Joe Rantz, arriving at the college and merging the dreams from his hardscrabble life with that of other sons o Quite an uplifting story of the young men from the University of Washington who took the gold medal for nine-men shell rowing at the 1936 Olympics in Berlin. Like Hillenbrand’s wonderful book “Seabiscuit” this is a tale of underdogs overcoming personal adversities and capturing the attention of a nation laid low by the Great Depression. Starting in 1933, we get the story of a young man, Joe Rantz, arriving at the college and merging the dreams from his hardscrabble life with that of other sons of miners, farmers, and lumbermen of the northwest. The other story is that of the coaches who mold and inspire this raw human material into a team which hopefully can beat their traditional rivals, University of California at Berkley, and challenge in the annual regatta in Poughkeepsie the historical masters of the sport, the elite private colleges of the East. These include the crafty and laconic head coach, Al Ubrickson, and legendary boat builder George Pocock, the guru of a Zen-like philosophy of rowing and master of techniques adapted from Thames working boatmen that he picked up from his days at Eton. Joe’s family was hurt bad by the depression. He lost his mother at a young age, and his father married a much younger woman who favored her own children over her stepson. At one point she forces Joe’s father to make a move, leaving Joe behind to fend for himself at age 14. A heartbreaking story to read about. But he became strong from plenty of outdoor work, self-reliant to the extreme, and ripe for a sense of belonging that a team sport can engender. Going out at dawn in the bay in all kinds of weather and pushing himself beyond exhaustion and pain was something he could handle well. His new girlfriend is a big support, though she finds it hard to understand how Joe can forgive his father for the abandonment. It took a lot for the coaches to help Joe surmount a wavering confidence and performance so bound up in a fundamental mistrust of people. Pocock eventually found an angle to instill a way for Joe to submit himself to a trust in his teammates. George Pocock learned much about the hearts and souls of young men. He learned to see hope where a boy thought there was no hope, to see skill where skill was obscured by ego or by anxiety. He observed the fragility of confidence and the redemptive power of trust. He detected the strength of the gossamer threads of affection that sometimes grew between a pair of young men or among a boatload of them striving honestly to do their best. And he came to understand how those almost mystical bonds of trust and affection, if nurtured correctly, might lift a crew above the ordinary sphere, transport it to a place where nine boys somehow became one thing—a thing that could not quite be defined, a thing that was so in tune with the water and the earth and sky above that, as they rowed, effort was replaced by ecstasy. It was a rare thing, a sacred thing, a thing devoutly to be hoped for. And in the years since coming to Washington, George Pocock had quietly become its high priest. I especially appreciated the segments about Pocock’s story. How he designed and constructed by hand the elegant 60-foot racing shells. The special qualities of wood for each component of the boat, buoyant and flexible Western red cedar for the panels, long straight sugar pine for keels, and resilient and strong ash for the frames. Joe grooves on this artistry, based on his experience working on hauling cedar out of woods with horses and hand cutting of shingles. Pocock’s marvels were so outstanding that soon all colleges in the U.S. were using his boats. …the greatest paradox of the sport has to do with the psychological makeup of the people who pull the oars. Great oarsmen and oarswomen are necessarily made of conflicting stuff—of oil and water, fire and earth. On the one hand, they must possess enormous self-confidence, strong egos, and titanic willpower. They must be almost immune to frustration. Nobody who does not believe deeply in himself or herself—in his or her ability to endure hardship and to prevail over adversity—is likely even to attempt something as audacious as competitive rowing at the highest levels. The sport offers so many opportunities for suffering and so few opportunities for glory that only the most tenaciously self-reliant and self-motivated are likely to succeed at it. And yet, at the same time—and this is key—no other sport demands and rewards the complete abandonment of the self the way that rowing does. Great crews may have men or women of exceptional talent or strength; they may have outstanding coxswains or stroke oars or bowmen; but they have no stars. The team effort—the perfectly synchronized flow of muscle, oars, boat and water; the single, whole, unified, and beautiful symphony that a crew in motion becomes—is all that matters. Not the individual, not the self. Good crews are good blends of personalities: someone to lead the charge; someone to hold something in reserve; someone to pick a fight; someone to make peace; someone to think things through; someone to charge ahead without thinking. Somehow all this must mesh. That’s the steepest challenge. Even after the right mixture is found, each man or woman in the boat must recognize his or her place in the fabric of the crew, accept it, and accept the others as they are. In short, a good coxswain is a quarterback, a cheerleader, and a coach all in one. He or she is a deep thinker, canny like a fox, inspirational, and in many cases the toughest person in the boat. Throughout the book we get interludes on the preparation of the Germans for using the Olympics as a great propaganda showcase of Nazi greatness, proof that they were the pinnacle of Western civilization and not monsters. The mastery of filmmaker Leni Riefenstahl and Minister of Propaganda Goebbels in pulling off this largely successful triumph is highlighted well and placed in contrast with the perspective of the rowing crew of ordinary Americans from average walks of life. They made sure no anti-Jewish signs were visible and underclasses like Gypsies were hustled out of town. Germany won most of the rowing races, but the win by the boys from Washington put a nice dent in their armor. The exciting details of adversities the American rowers had to overcome on the day of the competition awaits your reading pleasure. The black track star Jesse Owens did even more damage to Aryan pride by winning four gold medals (the main character of Hillenbrand’s biography of Louis Zamperini, “Unbroken”, also competed in longer distance races but did not win). I was swept by gratitude for their goodness and their grace, their humility and their honor, their simple civility and all the things they taught us before they flitted across the evening water and finally vanished into the night. I'm going to start off by saying that I'm in the minority on this one, and I'm ok with that. I felt like I was rowing through the Nile River getting through this book. I wanted it to be great, I wanted it to read like a narrative story, and most of all, I wanted to connect to the characters. I mean, who wouldn't love poor Joe Rantz- a guy that comes from nothing and literally gets left behind by his family- succeed at something?? The story at small points held my interest, and the last chapter w I'm going to start off by saying that I'm in the minority on this one, and I'm ok with that. I felt like I was rowing through the Nile River getting through this book. I wanted it to be great, I wanted it to read like a narrative story, and most of all, I wanted to connect to the characters. I mean, who wouldn't love poor Joe Rantz- a guy that comes from nothing and literally gets left behind by his family- succeed at something?? The story at small points held my interest, and the last chapter was by far the best. I just couldn't get into this book. It had all the right ingredients, but ultimately, I'm disappointed. You probably already know this book is about the majestic quest of the U.S. rowing team for Olympic gold at the 1936 Berlin Olympics. I doubt I can add much to persuade you to read this outstanding book of gold and glory telling a story evocative of Greek mythology, a tale of nine young men from the University of Washington, their origins, their Odyssey into a land run by evil men, and the epic of their endurance, resilience, teamwork and victory. This is a book that I cannot help believe that I would have found just as rewarding if the rowing team had been from any Allied power in WWII, a war which obviously followed soon thereafter. We can be grateful for writers like Mr. Brown, who so splendidly capture the near-mythical moments of the past. If you haven't read this, I cannot prevail upon you enough how you might want to consider it, particularly with the Rio Olympics beginning this week. I am not competitive and team sports do not enthuse me, yet still I got excited and was rooting for the American team. Crazy but true. Every darn reviewer says the same thing! I have to explain what I think happened to me. It took me a while to feel the excitement. Half-way through the book I had an epiphany. The reason why I am not into competitive team sports is not that I couldn’t care less who wins, but that I am one who doesn't and never has enjoyed working together in a group. I am a loner I am not competitive and team sports do not enthuse me, yet still I got excited and was rooting for the American team. Crazy but true. Every darn reviewer says the same thing! I have to explain what I think happened to me. The author personalizes the Olympic win through Joe Rantz, one of the American rowing crew that won the Olympic Gold in Berlin in 1936. One of eight oarsmen, one of nine if you count in the coxswain. But you have to count in the coach, Al Ulbrickson. You have to count in George Pocock, he made the boats. These shells are not just any old boats. They are made with western redcedar (Thuja plicata), but more importantly they are made with love and care. You have at least eleven people working together and the only way to succeed is to forget your own self and become one with the others. THIS is what I had to understand. It didn't help to be told this, in the first half of the book, but finally I understood it, in my heart, in my being. That is the epiphany. The complete synchronism of a group is a beauty to behold. By tying the Olympic win to these people the author makes you understand. Tell me, how many books can pull in a reader when the subject is a whole group of people? Brown succeeds. Particularly Joe Rantz and George Popcock, their life stories grabbed me, but plenty is told of the others so you understand how it happens they all became one. You cannot be told to feel what you don't feel. You cannot be lectured or threatened with, "Otherwise you will fail!" It just has to happen and the reader has to see it happen. Joe, he too had to have such an epiphany. Topics covered - the infatuation with Hitler in Berlin in the 30s, antisemitism in Germany and the US in the 30s, the publicity stunt of Leni Riefenstahl, the Depression, a dysfunctional family, the beauty of wood and of course rowing. All of these topics are woven in bit by bit. They are not dumped on you, so you sink. You have to understand the art of rowing to understand the win. I had quite a bit to learn. The only thing I worried about is how much of this "team spirit" credo was a creation of the author to make a good story and how much was what actually was going on in Joe's head then, back there in the 30s. I am a born skeptic. I assume this book is based on Brown's talks with Joe. I certainly hope so. There is a succinct epilog that details what happens to all of the central role-players after the 1936 Summer Olympics. It follows each of them until their respective deaths. The narration by Edward Herrmann was p-e-r-f-e-c-t! During the races, at least by the book's end, I was sitting on the edge of my seat, it was so very exciting. Clearly spoken and a good speed. Easy to follow. Here is a Cinderella story in modern format. This book had been on my TBR pile for a while and I read it as part of one of the challenges I participate in. I throughly enjoyed Brown's writing style. It made the book un-putdownable. I wanted to keep going to the end. In this sport history book you will find characters who will wrench your heart and that you keep rooting for. This rowing crew started out as rag-tag but eventually became a whole unit. Mostly, if you are feeling down, this work is very inspiring. And it can help you discover your This book had been on my TBR pile for a while and I read it as part of one of the challenges I participate in. Surely one of the best books I've read, and undoubtedly one of the finest audiobooks ever produced. Without any bells, whistles, or voices, Edward Hermann magnificently narrates the story of 9 ordinary kids and their extraordinary path to Olympic gold. It's one of those rare works of non-fiction: one that told me the whole story, and yet left me wanting to find out so much more. My high school boyfriend went to college at MIT and joined crew. He sent me his workout jersey and I slept in it until we broke up. We both looked at "crew" the same way: upper class, rich boys' sport. Something slightly risqué for an unathletic Midwestern engineering student to do. Now I live in Seattle, near what I have discovered is the hub of the West Coast rowing Mecca - University of Washington. I always keep my eye out for interesting books to read. Now that I live in the Pacific Northwest My high school boyfriend went to college at MIT and joined crew. He sent me his workout jersey and I slept in it until we broke up. We both looked at "crew" the same way: upper class, rich boys' sport. Something slightly risqué for an unathletic Midwestern engineering student to do. Now I live in Seattle, near what I have discovered is the hub of the West Coast rowing Mecca - University of Washington. I always keep my eye out for interesting books to read. Now that I live in the Pacific Northwest, local history is so rich, I can practically find a book at any store that will deal with it and feed my need for interesting material. But this one came out of the blue. I read a small article in our paper about it. Varsity crew from University of Washington brings home gold medal from Berlin in 1936. And they did. 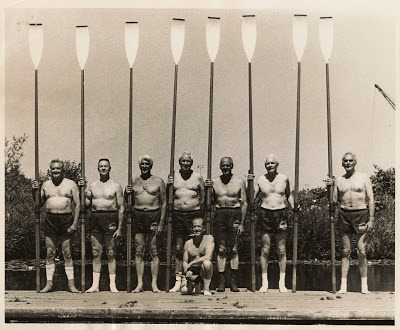 Eight oarsmen and their cox found poetry and zen to defeat all other comers that year. Nine native Washingtonians, pretty much all engineering students, all sons of modest fathers, sons of the Great Depression, working, going to school and rowing. Why? For Joe Rantz, crew gave him a way to stay in college. Not a high school athlete, Joe tried out for crew as a freshman because if he made the cut, he would be given a job that would allow him to stay in school. He went through hell to make the cut. It wasn't that he didn't like rowing. He'd just never have thought of doing it for its own sake. It's a Cinderella story of course. Brown tells it beautifully, his prose almost as soft and smooth as the strokes that propel the Husky Clipper on its way to victory in Berlin. He works well with what he has - some diaries, for a while, some relatives to interview, for a very short while Joe Rantz himself, the inspiration for the book. And he achieves Joe's dying wish that he tell the true story: "It has to be about the boat." "The Boat" is a nebulous thing, neither the shell nor the men in it. A bit of both. A lot of both. Once you think you understand, you lose that understanding. It's a situation uncommon in sport and can not be described in the typical sports metaphors. There is a group of people who crew a shell - a team - but rowing is not a "team" sport. None of the people in the shell can act alone, none can row alone while the others fight off attacks by other crews. They all have to act together. They have to completely lose themselves in order to succeed. It's absolutely zen - you must lose yourself in order to find yourself. And you can't tell that with a straight face to a bunch of over 6' brawny farmers and lumberjacks from Washington, Grasshopper. But that is the essence. And that's what we and the crew of the Husky Clipper learn over the course of the book. You know the ending; that's why you're reading the book. But when you get to the final race your heart is in your throat. There was at least one "clunker" for me that I remember which obviously didn't dent my enthusiasm. The crew's stroke was extremely ill with possibly pneumonia during the Olympics and rowed while he was sick (let's not get into the discussion about using sick athletes.....). Brown doesn't deal with this after the fact though. What DID he have? Did he end up in a hospital in Berlin? Apparently not. But that still hangs out there for me. The coach had actually replaced him but the crew asked for him back and got him. The cox thought he had died at one point during the race and yet Brown simply says that after the race the guys celebrated, went into town, etc. There were a couple of other places like that but obviously not as disturbing to me. Finally a 5 for a non-fiction read! Not since Moneyball : The Art of Winning an Unfair Game and Seabiscuit: An American Legend have we had a sports book this good! This story about the University of Washington crew team that won gold at the 1936 Olympics is fantastic and oh so much more than a book about crew, sports, or merely nine guys. It cover the depression, collegiate crew, Leni Riefenstahl's role in the rise of Nazi power, emergent of the Western states, and the magic that can happen when Finally a 5 for a non-fiction read! Not since Moneyball : The Art of Winning an Unfair Game and Seabiscuit: An American Legend have we had a sports book this good! This story about the University of Washington crew team that won gold at the 1936 Olympics is fantastic and oh so much more than a book about crew, sports, or merely nine guys. It cover the depression, collegiate crew, Leni Riefenstahl's role in the rise of Nazi power, emergent of the Western states, and the magic that can happen when individuals give their best and become a team. Centering on rower, Joe Rantz, the book tells the story of resiliency, and is a testament of how individuals can overcome humble and tragic beginnings. The cast of characters is amazing. The coach and boatbuilder are just as important as the other eight in the boat. The 4.57 star rating is totally deserved. Harmony, balance and rhythm. They`re the three things that stay with you your whole life. Without them civilization is out of whack. And that's why oarsman when he goes out in life, he can fight it, he can handle life. That's what he gets from rowing. 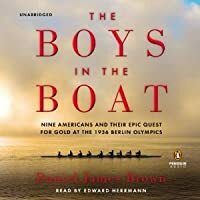 Daniel James Brown`s The Boys in the Boat: Nine Americans and Their Epic Quest for Gold at the 1936 Berlin Olympics is an amazing and intimate account of nine working-class American boys and their epic quest to becoming world-class rowers, which results in them winning Gold at the 1936 Berlin Olympics, at a time when Hitler and Nazis were in power in Germany. What a hodge-podge mix of interesting and at other times dull events! The book jacket calls it "breathtaking" and I've not found that yet. It also says it's a "suspenseful tale of triumph" and I haven't found the suspense yet. The back jacket terms it "riveting" and I haven't found that yet. Turns out that about 60% through the story, the author kicks it in. The last of 4 sections picks up the pace and is a fine telling of an interesting story, and it becomes a fascinating tale of strategy, stre What a hodge-podge mix of interesting and at other times dull events! The book jacket calls it "breathtaking" and I've not found that yet. It also says it's a "suspenseful tale of triumph" and I haven't found the suspense yet. The back jacket terms it "riveting" and I haven't found that yet. Turns out that about 60% through the story, the author kicks it in. The last of 4 sections picks up the pace and is a fine telling of an interesting story, and it becomes a fascinating tale of strategy, strength, dedication, boat construction and superior coaching - a total synthesis which produced champions. Indeed, though the title tells us that it deals with the 9 boys in the Washington shell, as pictured on the front cover, the author tells a lot about Joe Rantz, some about Shorty Hunt, a bit about Roger Morris, then in the last of four sections we learn the others were made up of different UW students, including coxswain Bobby Moch. Brown dedicates the book "for" the nine, whose lives and careers and deaths he summaries in a very fine Epilogue. OVERALL, the book lacks a clear focus, thereby seeming disjointed, mixing significant events with the trivial or irrelevant. For instance, there are 2 pages devoted to a "cyclonic windstorm" (which had nothing to do with the sculling). And 20 pages are devoted to the famous German movie-maker Leni Riefenstahl and asserting that Goebbels propositioned her on his knees (which had nothing to do even indirectly with the boys in the boat). And such other irrelevances as that a Seattle hockey team defeated the Montreal Canadians many decades ago. And that the "Black Sunday in the Plains blew away twice the amount of soil that had been excavated from the Panama Canal." Also extensive reconstruction details for the Berlin Olympics stadium, far from where the crew races were to be held. Other examples of which there are hundreds:- Before sailing to Europe, the boys visited Loew's State Theatre for Duke Ellington "under the theater's huge Czech-crystal chandelier, sitting in red-plush theater seats and surrounded by gilded woodwork, they listened entranced as Ellington and his orchestra lilted through Mood Indigo [as author Brown continues naming all the pieces] and Joe basked in the bright, brassy music, soaking it in as it washed over him, feeling it swing him". Irrelevant to the rowing story? It adds "color," and such extraneous journalistic flourishes throughout the book must add over 100 pages of extraneous interest to the core history of the boys and their singular rowing experiences and victories. The best parts are about the sport of rowing sculls of which there is a lot of lore and technical information given here. (Thus I give the book 3 instead of 2 stars.) On this aspect of rowing, the author did well in portraying master craftsman George Pocock who emigrated from England to Canada and settled in Seattle to market his extraordinary skills as boat-maker - with the author giving us a lot of fine technical info. Even Pocock's use of Sperm whale oil on the shell underside before the final winning Olympic race. All ll chapters begin with a relevant quotation from Mr. Pocock, from a 1987 biography of Pocock. And, indeed almost 'riveting', the few scull races which these 9 boys won in Seattle, Oakland, Poughkeepsie, and then a different set of nine at the 1936 Olympic Games in Berlin were remarkable extraordinary athletic feats worthy of book treatment. As a book about a notable slice of sporting history, this book may be compared to Doris Kearns Goodwin's 1998 "Wait Till Next Year" and Laura Hillenbrand's 2001 book "Seabiscuit" - though in my comparison this book comes in at best a very weak third. Daniel James Brown fell in love with the written word when he was five and his mother first read Danny and the Dinosaur to him. Since then he has earned a BA in English from the University of California at Berkeley and an MA in English from UCLA. He has taught writing at San Jose State University and Stanford University and now lives in the country east of Redmond, Washington, where he writes nonf Daniel James Brown fell in love with the written word when he was five and his mother first read Danny and the Dinosaur to him. Since then he has earned a BA in English from the University of California at Berkeley and an MA in English from UCLA. He has taught writing at San Jose State University and Stanford University and now lives in the country east of Redmond, Washington, where he writes nonfiction books about compelling historical events.